Hear Dr. K as he leads you through EXHALEX, a quick recharge method to reduce stress. You can do it in just 10 minutes almost anywhere. EXHALEX means exhale & relax. You might have observed that all relaxation processes like laughter, crying, yawning and sigh of relief are connected to exhalation. It helps to release all fears, stress and tensions from the body and mind. EXHALEX is a quick recharge method for highly stressed people. You can do it in just 10 minutes even while sitting in your office chair. In this, we focus our mind on a particular part of the body and deliberately relax the muscles of that part while exhaling. In this process both inhalation and exhalation are prolonged and slow. We also add the power of imagination to it. While inhaling, just imagine you’re filling in fresh oxygen and universal energy into a particular group of muscles. While exhaling, focus your awareness on that group of muscles and imagine a feeling of relaxation. 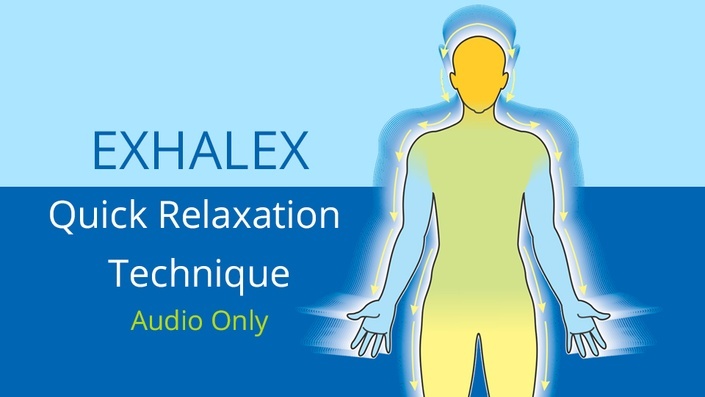 It is very easy to do EXHALEX as Dr. Kataria leads you through a guided session. As you listen to his mesmerizing voice, relax a particular group of muscles one by one. Finally, relax the entire body. If you feel a particular part of your body is more tense and painful as in the case of neck & shoulder muscles when under extreme stress, you can repeat these cycles till that part of the body feels relaxed. You can learn this technique by repeatedly listening to Dr. Kataria’s voice until the time you can do it by yourself. Track 1- Theory of EXHALEX. Track 2- A guided session to help you learn & practice the technique. Keep repeating these cycles until you feel completely relaxed.